This is sorta report… But I am getting ready for the blog-aview, bloggerview? I dunno… anyway, Dr. Hanson has graciously agreed to an interview. It will be posted next week. That means, you have a few days to get the book and maybe, just maybe, ask a few questions. Amen? Do you sometimes find yourself searching for a way to approach God or wondering how to get out of a devotional slump? Do you long for spiritual guides you can trust? This guide to prayer is rooted in centuries of Christian tradition. In each chapter you’ll meet a figure from church history, such as St. Benedict, Martin Luther, John Calvin, St. Ignatius, Teresa of Ávila and Andrew Murray. You’ll learn how each of these spiritual giants uniquely connected to God through prayer. Each chapter provides an opportunity to practice a different method for prayer, including the divine office, the Lord’s Prayer, the Jesus Prayer, healing prayer and meditation on the Psalms. In the process your own prayer practice will be refreshed and renewed. 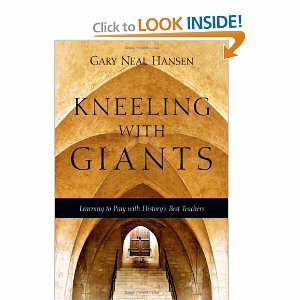 Journey into church history and enliven each day of your prayer life. This sounds like a great book, and for those who like to take prayer as a form of spirituality or spiritual discipline, this book may in fact be for you. Prayer… It does a soul good. What’s the sequel, “Learning to Admonish” with John Calvin? For years Calvin was the leader in dishing out admonishments to anyone brought before the Consistory in Geneva. We have the minutes of such meetings, but not the actual admonishments. But if they were anything like the words Calvin spoke to fellow Reformation leaders in letters then we know he had quite a tongue on him. Calvin simply liked having things done HIS way, writing letters to the town council demanding that adulterers and disobedient children be executed ala Mosaic Law. Making rules for Inns, including the need to say prayers before beer, and have a big Bible in each Inn from which the patrons may read. And he put forth lots of other laws. And he wasn’t satisfied until he built a university teaching his theology and all the printers in town were publishing his works.